This year’s Expo was another busy, hectic and rewarding event. Many products were showcased at this year’s event, with over 80 being brand new offerings. There were also many awards and recognitions at the Annual Winter Conference. Pioneers of Industry & Commemorative Awards, along with recognition of new Fellows were also celebrated at the 2017 conference. “It’s exciting to see such enthusiasm around the rebounding North American building and construction industry, and subsequent growth in demand.” said Clay Stevens, president of International Exposition Company, who manages the event. 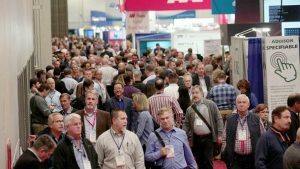 International Exposition Company has also announced that upcoming AHR Expos will be held in Chicago in 2018, Atlanta in 2019, and Orlando in 2020.